I thought I had seen the last of this issue several years ago, but we still have a couple of legacy single core CPU Windows XP boxes knocking around, and last week this problem reared its ugly head once more on a couple of machines. The symptom of this problem is that shortly after login, the automatic updates service runs to check for new updates against WSUS. While this scan occurs if you look in Task Manager the process svchost.exe is consuming 100 % of CPU resources making the machine pretty much unusable. You can verify whether wuauclt (the Windows update client) is the culprit in your case by running Process Explorer, and seeing if wuauclt is running under the svchost process. This issue always used to affect single core machines with relatively small amounts of RAM by todays standards. At the time this issue was fixed in the majority of cases by installing an updated version of the Windows Update agent which can be found here. Anyway, back to the present, and after releasing a handful of windows updates for XP in the WSUS console a few days ago I found that a couple of legacy XP machines had become unusable after login as svchost.exe was consuming 100% CPU. The client machines would stay like this indefinitely and never seemingly finished their scan for updates against WSUS. Straight away I looked in the C:\Windows\windowsupdate.log to check the client version and to see if anything else unusual was occurring. The update agent was up to date (version 7.4.7600.226) so this didn’t appear to be the old problem. 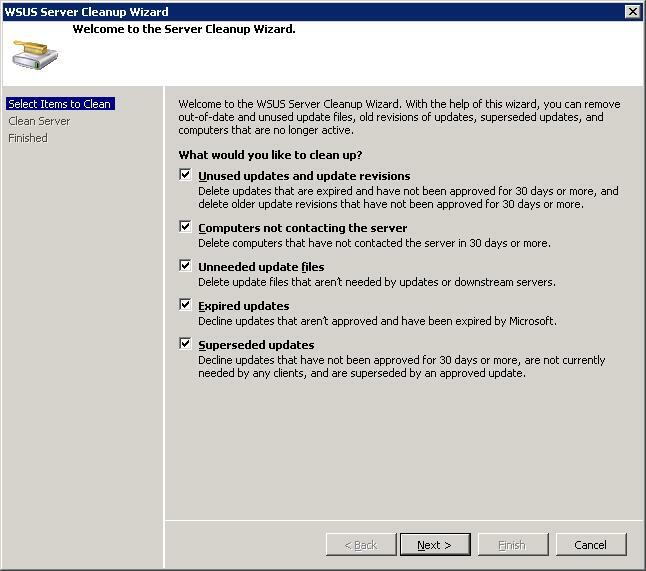 As the first part of the fix, I ran the WSUS ‘Server Cleanup Wizard’ on the server that the client was checking for updates against. I selected all the options as shown below to make sure the client wasn’t checking for any unecessary or superceded updates. 1.Click Start, click Run, type cmd in the Open box, and then click OK.
2.At the command prompt, type net stop wuauserv, and then press ENTER. 3.Click Start, click Run, type regedit in the Open box, and then click OK. Note Windows Update Agent 3.0 adds the SusClientIDValidation value. This value was released in May 2007. The other registry entries exist in both Windows Update Agent 2.0 and in Windows Update Agent 3.0. 7.At the command prompt, type net start wuauserv, and then press ENTER. 8.At the command prompt, type wuauclt.exe /resetauthorization /detectnow, and then press ENTER. 9.Wait 10 minutes for a detection cycle to finish. 10.Start the WSUS console to make sure that the clients appear in the WSUS console. After carrying out the above steps, the XP client machine completed the update scan within a few minutes and the CPU usage returned to normal.